Well, I didn’t get to drive the train, but it was as close as I was ever going to get to driving a train. Coming back to Medan after a four day holiday in Indonesia, the buses and trains were packed. Now I have been to Japan and China so I thought that I would be fine traveling on a packed train, but Indonesians take it to a new level. When the train pulled into the station, people ran to the doors that were already full. The people already on the train weren’t going to let anyone else on. We decided to wait for the next train in two hours time. 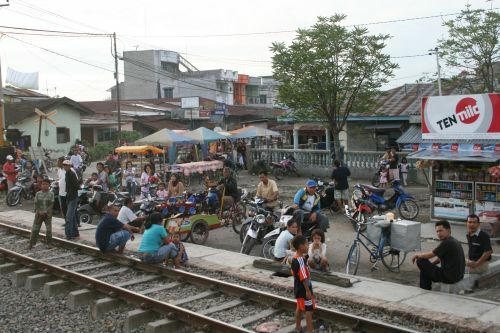 A few minutes later after asking about the next train, a train driver who was driving just the engine back to Medan, asked if we wanted to ride with him, as long as we bought him and his staff some cigarettes. It was better than waiting around for another two hours for a train that was more than likely going to be full too. I love trains, so it was a lot of fun riding with the driver and a couple of other passengers. Unfortunately there was only other seat, so we either had to stand for the three hour trip or sit on bits of cardboard. The views of the countryside were much better than what you see when you go by bus. Some kids played “chicken” with the train jumping off the tracks at the last minute. My heart raced everytime as they only had to trip and it would be “bye-bye” as there is no way that locomotive would have been able to stop in time. There are also so many little crossings along the way that don’t have gates. The driver had his hand on the whistle most of the way. Fortunately, we didn’t hit anyone, but it was amazing to see how many people would try and beat the train rather than wait for a minute for the train to pass. Loved reading your story about being in the driver’s compartment. 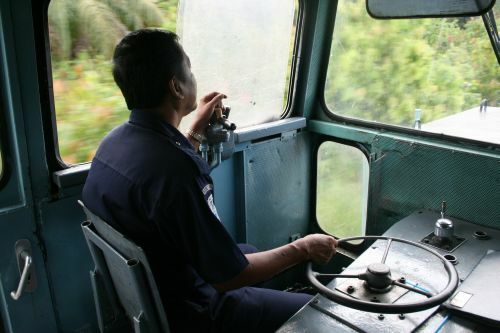 I was invited into the driver’s compartment of a train from Yogjakarta to Solo in July 2006- loved every minute of the experience. pPamela- who loves Indonesia with a passion. 9th trip in 2010 for about 7-8 months can’t wait. Thanks for the comment. It was a fantastic experience. I just remembered today how we passed through a real slum area just outside of Medan. It was something I hadn’t really seen yet here. I will be hitting the road soon so you should see more travel stories here soon. just take a look on the website, i hope you’ll like it. if you are interested, you can contact me on the blog. 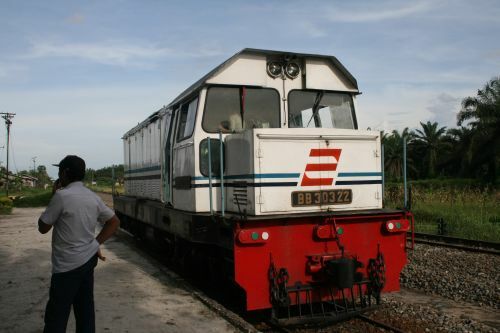 I surprised that you have rode the train in Indonesia, I am one of the lover train last 2 months I and my wife were driving train from Medan to Kisaran vv, The max. train speed only 60 km/hr, The return train took about 5 hrs for 130 km (Kisaran Medan)because the head (Diesel loco) got brake problems. 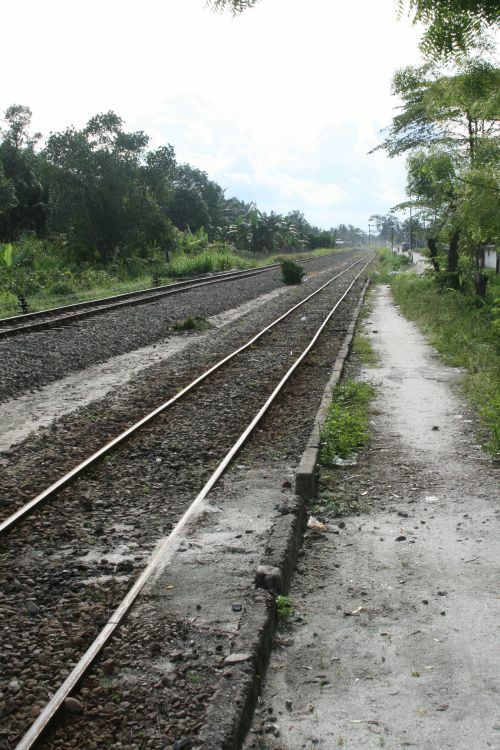 But that is Sumatra, the Java railway system is far better than Sumatra. 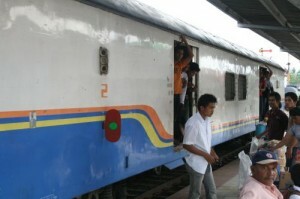 In Java trains can run up to 100 km/h, and they have many air-conditioned commuter trains.